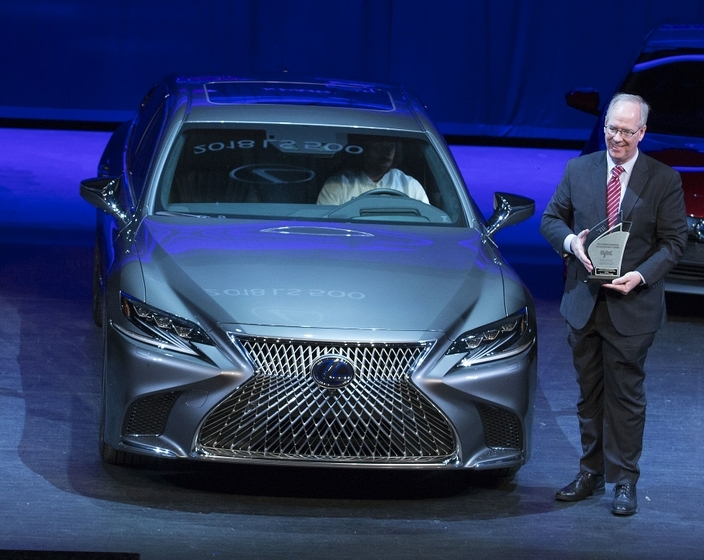 Newly introduced on the 2018 Lexus LS, the Lexus Safety System + Advanced package (LSS+ A) incorporates a newly designed millimeter wave radar sensor, a stereo camera system, plus new yaw rate and steering sensors and ads several new safety features to the already existing Lexus Safety System + (LSS+) bundle. 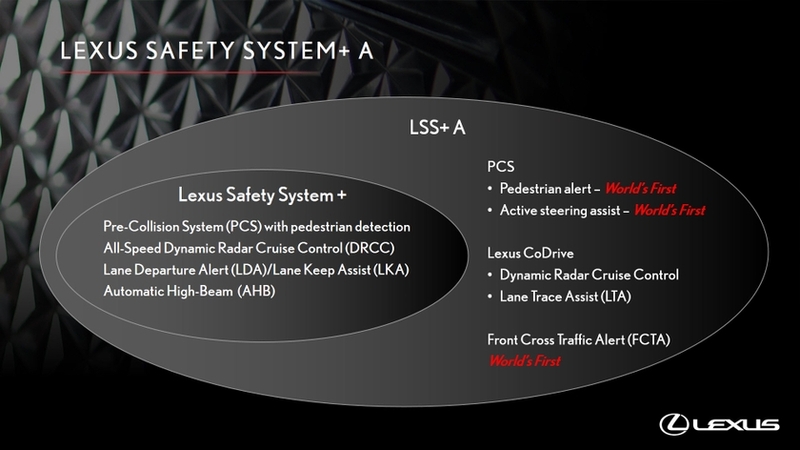 These new features are enhancements to the Lexus Pre-Collision System with Pedestrian Detection (see below). Linked to the vehicle’s Head Up Display, the Pedestrian Alert Function helps the driver notice people in front of the vehicle. Active Steering Assist helps prevent collisions that cannot be avoided through automatic braking alone. Active Steering Assist determines when there is a high possibility of collision with a pedestrian in the lane of travel or with a continuous structure, such as a guardrail. If the system determines that it is difficult to avoid a collision with brake control alone, but that it might be avoided with steering control, the system assists in collision prevention or damage reduction through automatic steering control in addition to activating an alert and applying the brakes. Lexus CoDrive adds Lane Tracing Assist to the basic functions of All-Speed Dynamic Radar Cruise Control (see below) to provide steering support that is in line with the perceived intentions of the driver on a highway and assist the driver in maintaining in-lane driving. Lane Trace Assist is an enhanced version of the already known to Lane Departure Alert (see below), as it provides greater lane marker detection while adding preceding vehicle tracing ability to help center the vehicle in its lane when lane marker visibility is poor or not available. By providing robust driving support on roads with many curves or in traffic jams, Lexus CoDrive largely decreases driver burden. Additional Lexus CoDrive features include indicator signal-linked control: When following a vehicle travelling slower than the system’s speed setting, signalling a lane change into the overtaking lane will initiate acceleration to assist with the lane change. Acceleration will continue until the set speed is reached, or until a preceding vehicle is detected. To help prevent collisions at intersections, Front Cross Traffic Alert is meant to detect forward cross-traffic vehicles. It helps provide intersection support by using radar to sense traffic that may be crossing in front of the vehicle. Alerts are displayed using the LS’s large head-up display and multi-information display. 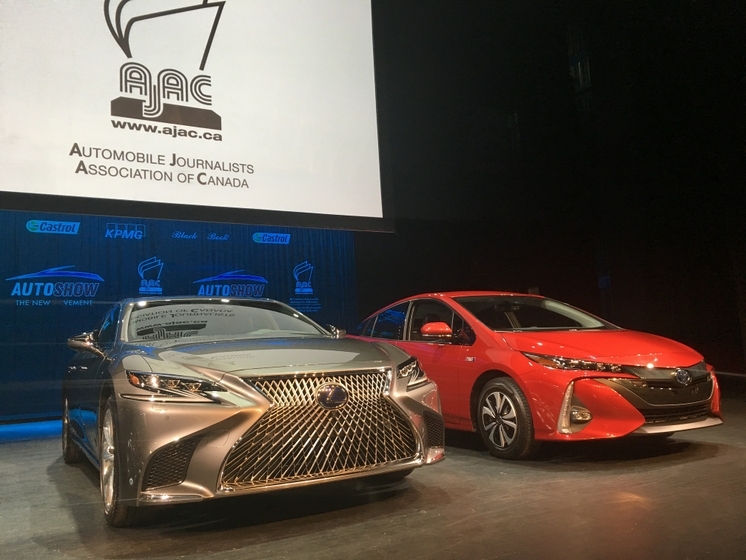 Other drivers can be unpredictable, so this system uses sensors – including millimeter-wave radar and a monocular camera – to detect vehicles, pedestrians, and obstructions in front of the Lexus. 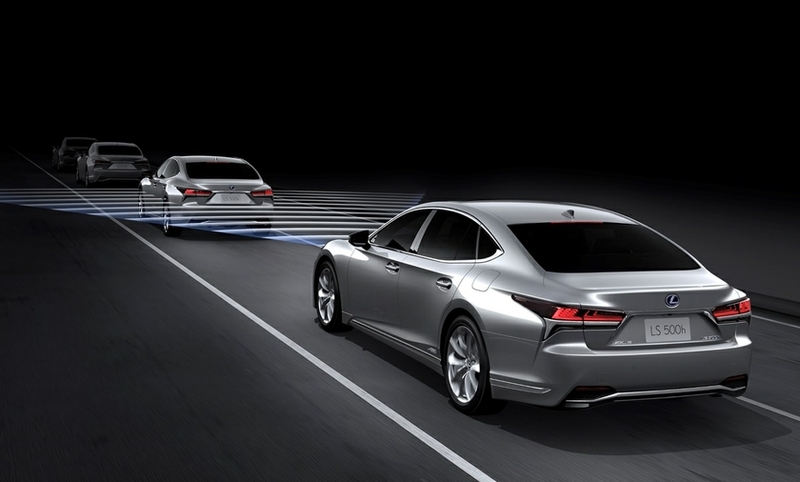 If the system determines there’s a high probability of a collision, it alerts the Lexus driver with an alarm. In situations where the system determines a collision is highly likely – or unavoidable – it automatically applies the brakes. Even the most focussed driver can become distracted. This system helps by monitoring the vehicle’s position in its lane. If the vehicle begins to deviate from its lane, the system warns the driver with a buzzer, a display notification, and a vibration in the steering wheel. This system helps the driver see better at night. It uses cameras located on the windshield to detect the headlights of oncoming vehicles and automatically switches to low beam headlights. Once the oncoming vehicle has been passed, the system switches back to high beams. 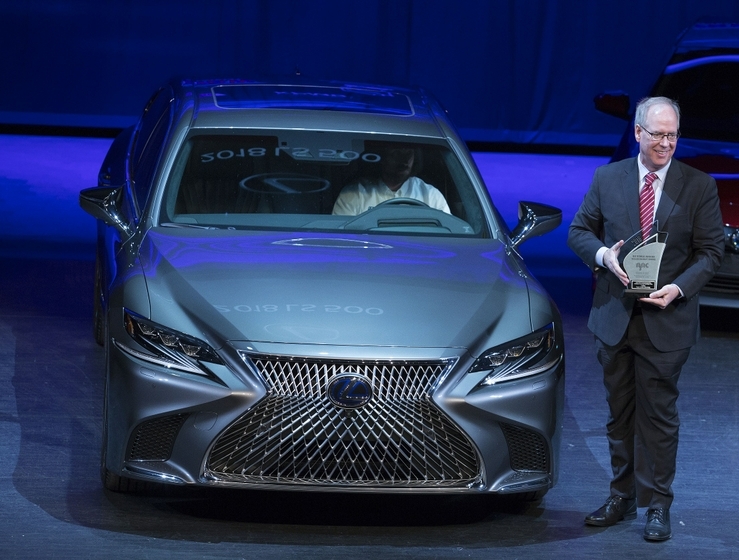 This system uses multiple sensors – including millimeter-wave radar – to determine the distance of vehicles in front of the Lexus. It then adjusts the speed of the Lexus with a preset range, to match the speed of the vehicle ahead. The result is that long highway drives are less tiring, and instances of sudden braking are far less frequent.